This summer Ibiza enters a new chapter with the launch of Hï Ibiza, the brand new club by Ushuaïa Entertainment. 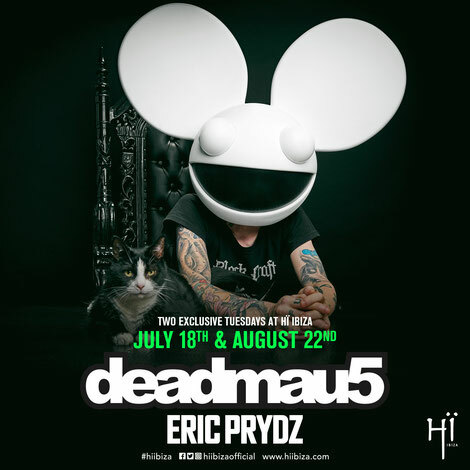 From May through until September Hï Ibiza will play host to selectors from the global electronic music scene, including Canadian deadmau5, who will join Eric Prydz at his debut Ibiza residency for two exclusive dates this summer. Few acts in electronic music compare to six-time GRAMMY-Award nominee deadmau5, aka Joel Zimmerman, whose sounds, live performances and iconic mouse head have made him a household name in dance music and well beyond since exploding onto the international scene nearly a decade ago. Despite his popularity, with headline performances at festivals around the world, Zimmerman remains somewhat of a rarity on the White Isle, playing only a few select shows there in recent years. Though it’s hardly surprising that Eric Prydz now heralds his return for the first time since 2014. Prydz’s big room progressive and techno sounds and love for immersive performances closely mirror Zimmerman’s in the best possible ways. Zimmerman’s shows with Prydz at Hï will be his only dates in Ibiza this summer, playing in the Main Room on 18 July and 22 August. With Hï Ibiza offering the Prydz team a blank canvas to work their magic, they will be debuting a bespoke production built specifically for the residency, creating a stage for Eric to present his blend of house and techno across his Pryda and Cirez D, aliases. The Prydz residency will bring a singular visual and audio experience to the Ibiza season, with Prydz curating the lineup for each party. In addition to deadmau5, guest acts lined up for the summer include Matthew Dear, Kölsch, Pig & Dan, Agoria, Catz 'N Dogz, Tube & Berger, Dusky and more.